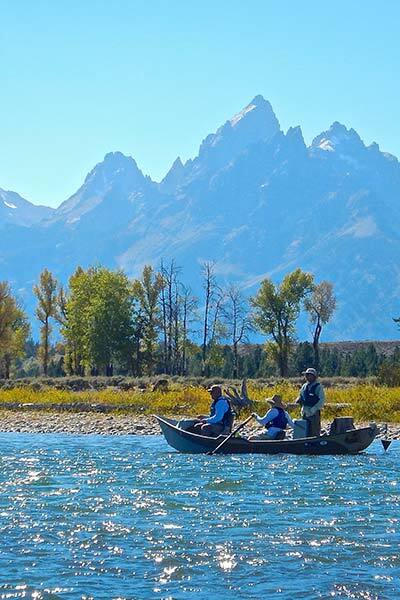 When’s the best time to fish in Jackson Hole? We frequently are asked “When is the best time to plan my Jackson Hole Fishing Trip?” In Jackson Hole, every month offers unique fishing opportunities. Check our month-by-month timing chart below for details or contact us directly and we’d be glad to assist with your fly fishing planning. During January most of the fishing is done through the ice with jigs on Jackson Lake. The Snake, Salt, the South Fork, and some of the Henry’s Fork are all open to catch and release fishing, but the weather is usually to cold to make it feasible. If there is a hatch it is midges, but nymphs usually work best. Usually the weather warms a little in February, making it feasible, at least some days, to fish the Snake, Salt, South Fork or Henry’s Fork. In some places you will need snowshoes to access the river. Check with us at the shop for access areas and check the regulations to see what areas are open. The main hatch is midges, but there is good fishing with small nymphs. Fishing with jigs through the ice is prime this month and the largest fish are usually caught through the ice in February. The weather usually warms a bit in March, which makes fly fishing on the Snake, South Fork, Salt, and Henry’s Fork more feasible. The main hatches at this time of the year are midges and Blue Wing Olives, but nymph fishing will work well too. You will need snowshoes to access some areas. Be sure to check with our store for access areas and to check the regulations to see what is open. Fishing with jigs through the ice on Jackson Lake is still possible. April 1 marks opening day of the general season for many of the waters in the area. Because of the snow, access may not be good to some of the rivers. The Snake, South Fork, Salt and Henry’s Fork are still the main rivers fly fished. We begin guided float fishing trips on the Snake at this time and the fishing is generally good thru most of the month. The ice begins to clear off some of the lakes in the area. The Snake and tributaries generally become silty with runoff about the beginning of May. Some sections of the Henry’s Fork are open and somewhat silty but clear enough to fish. Ice comes off some of the lakes about mid-May, depending on elevation, snowpack, and weather. The Firehole in Yellowstone Park opens on Memorial Day weekend and we will offer trips there. The South Fork over in Idaho is fishable with some dry fly action on caddis plus nymphs. General fishing season opens in Idaho, but most rivers are silty. The salmonfly hatch on the Henry’s Fork begins in mid- to late-May. There is good fishing on the Firehole in Yellowstone Park. Lewis Lake is generally ice-free and fishable by the first week in June. Yellowstone Lake opens for fishing on June 15. Both of these lakes are usually great fishing when they open. The Henry’s Fork is somewhat silty but fishable with nymphs and streamers. The South Fork is fishable throughout the month but mostly with nymphs and streamers. Fishing on many of the lakes remains good throughout the month. Runoff on the Green usually ends about the beginning of July and the river becomes fly fishable. Prime dry fly fishing on the Green usually begins about the middle of the month. The Snake generally clears by early in July and becomes prime dry fly fishing around the end of July. The Snake river tributaries generally begin clearing by the beginning of July, depending on the drainage. The Salt generally clears by the beginning of the month. The salmonfly hatch begins on the South Fork about July 7 and that kicks off the good dry fly fishing. Since the South Fork is a tailwater fishery it never really gets silty. Prime dry fly fishing on all of the rivers in the Jackson Hole area. Guided float fishing trips on the Snake River are the best in the year. Prime dry fly fishing on all the rivers in the Jackson Hole area. Some of the smaller streams may get a bit low in low water years so you have to fish the prime water in each stream. This is one of the best months for guided fishing trips on the Snake River. Some people say that October offers some of the best fly fishing of the season. While that’s debatable, it certainly offers great fly fishing without the crowds you get earlier in the season. Early in October the Snake drops from its summer level to much lower winter flows. When this happens the fish become more concentrated and the fishing is great. The tributaries are all open at that time of the year and the water is low. The fish are concentrated in pods in the tributaries; when you find one you will generally find several. You do, however, need to be better prepared for weather. Just about anything can happen at that time of the year. The Snake is open for fishing but the tributaries are closed. The Snake is usually only good fishing for a short period of time during the middle of the day. The South Fork is generally fairly good fishing with streamers and Blue Wing Olives most of the month. Jackson Lake once again opens for fishing and is generally good. Fishing closes in Yellowstone Park early in the month. The Henry’s Fork has good hatches of Blue Wing Olives. During December the ice may be thick enough to fish on Jackson Lake; beware for possible thin spots. The Snake, South Fork, Salt, and Henry’s Fork all have areas open but the feasibility of fly fishing will depend on the weather. Snowshoes may be necessary to access rivers. Check with our pro fly shop for specifics.